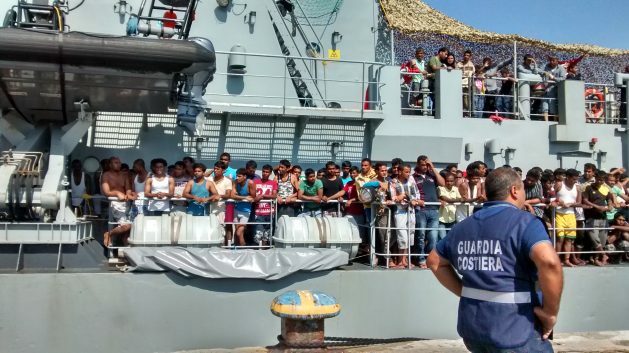 ROME, Jul 10 2018 (IPS) - Debating on migration as an emergency is a huge mistake and treating it as such opens the door for illegal and unfair activities, says a migration expert. According to the United Nations Refugee Agency, about 42,000 migrants arrived in Europe this year as of Jun. 30. It may still be early to compare this with last year’s figure of about 172 000 migrants, but if the overall migration in previous years is anything to go by the numbers seem to be decreasing from a high of just over one million migrant arrivals in 2015 to almost a third that in 2016. In comparison to Europe’s total population of about three quarters of a billion people, some see this as a drop in the ocean and not an emergency situation. “I remember while I was working in Trapani, that we had to wait for slippers for migrants that were purchased from a supplier in Messina, which is on the other side of Sicily. We could buy slippers anywhere close to Trapani but the [purchase of the slippers] had been subcontracted to that specific seller,” she tells IPS. The racket controlled many municipal services, such as rubbish collection and management, public spaces’ maintenance and refugee centres. The investigation revealed that most of those financial resources were never spent for what they were intended — to improve living conditions in the refugee centres — but were siphoned off. “I can see clearly a link between criminality and some political parties in Italy,” says Verduci. “There are criminal organisations are interested in prolonging the economic and social uncertainty of migrants who, if unemployed and isolated from society, risk to enter into illegal activities,” says Verduci. Whatever you say, no one wants them!!! The Libyan coastguard is doing a great job, but only as long as there is no interference. Any boats interfering need to be confiscated.